How to make regulations a common good? Differences in regulatory norms are increasingly seen as the key barriers to the growth of regional and global markets, and regulatory disputes make up some of the most contentious issues in world politics. Negotiations among the most developed economies of the world about regulatory synchronization have made little progress in the last decade, and nearly all harmonization attempts failed when they had involved economies at lower levels of development. 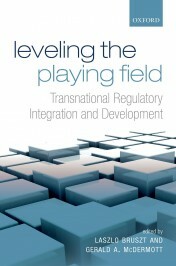 In a world in which almost all multilateral efforts at creating common market rules fail, and a regional agreement on common rules in a single policy area is described as a major breakthrough, the experience of the smooth transfer of nearly 80 thousand pages of regulations to the Central and Eastern European (CEE) countries in 33 policy areas offers some interesting lessons. Explanations for this exceptional success have relied on arguments based on the skillful use of conditionality linked to EU membership. Citizens in the Eastern peripheries of Europe, as we have seen in several cases, were ready to make considerable sacrifices for the promise of membership in the richest club of the globe. Brussels, indeed, had exceptional leverage, when it has negotiated with countries waiting outside the gates of the EU. Ten years after the CEE countries were invited to join the European Union, the power of such explanations necessarily declines. If it is about honoring EU regulations, the not-so-new EU members from Central and Eastern Europe perform at least as well as the most developed core economies in Europe. The high sustainability of the common market rules in these countries calls attention to a lesser-known aspect of the regulatory integration of the CEE countries. The EU differed from other regions of the world by its encompassing experimentations with strategies to change local conditions and increase the capacity of domestic actors to benefit from taking the common rules of the EU market. To do so, the EU has created regional capacities to anticipate and alleviate the potential negative developmental consequences of transferring to lesser-developed countries the market rules of the most developed European countries. Instead of using solely the incentives linked to membership, the Commission involved the governments of the applicant countries in a nearly decade-long joint problem solving in more than thirty different policy areas. Special attention was devoted in these processes to building elementary economic state capacities in the CEE countries. State restructuring was growingly embedded by the Commission in twinning programs, a transnational network of technical assistance mobilizing thousands of public and private actors in the old EU member states. Besides creating domestic capacities to implement the European policies and rules, the Commission also tried to strengthen (or in many cases, to create) basic planning capacities, abilities to foresee and manage potential negative development externalities of integration. The EU’s assistance programs that have transferred in the first wave of Eastern enlargement 28 billion Euros to the CEE countries, had been linked to the problems detected by domestic developmental plans, several times done in collaboration between domestic and external actors. While the direct beneficiaries of these strategies were in the CEE economies, the goal of these institutional experimentations was primarily to defend the interests of the EU insiders. The old member states were at least as afraid that the applicant countries will not be able or willing to play by the common market rules than from the success of imposing tens of thousand of pages of regulations on the CEE countries. In the first case, fearing the new members deviating from EU rules, the primary fear was that the new members will out-price compliant firms in the old member states, provoke a race to the bottom and, in the end, might induce the disintegration of the common market. In the latter, the case of successful imposition, the fear was that the rules that have worked in the most developed economies might have unpredictable negative developmental effects in the less developed economies. The old member states might not be able externalize the costs of political and/or economic crises and the costs of enlarging the common market might way surpass its gains. More generally, these programs were based on the recognition that strategies that focus on the short term interests of the more powerful actors alone can have welfare effects that are inferior to solutions based on collaborative exploration of opportunities to reduce in time the potential negative developmental consequences of regulatory integration. On a much smaller scale, there are several similar experimentations in other regions of the world. Regional developmental banks in several continents experiment with solutions linking regulatory integration with the production of regional public goods. In specific transnational or global policy fields we can witness the coming about of experimental forms of governing rule harmonization involving a big variety of transnational private and public actors. Street level bureaucrats in several evolving market economies are given discretion to involve diverse domestic actors and multinational firms in creating local settlements that could make implementing transnational rules rewarding to the involved actors. While these strategies differ dramatically in their scope, they have in common the goal to create sustainable common regulations by way of making them a common good. This implies a joint search for ways to get in synch the requirements of implementing uniform transnational rules with the interests and capacities of domestic actors operating in multiple diverse local institutional contexts. There are no universal recipes, the policies that work might differ across countries, sectors and policy areas. The governance of such regulatory integration thus presupposes in most of the cases the simultaneous upgrading of the coordinating and policy making capacities of domestic and transnational institutions. Laszlo Bruszt is Professor of Sociology at the Department of Social and Political Sciences of the European University Institute, Firenze. His earlier research on the economic and political transformation in the post-communist countries resulted in several scholarly articles and the award-winning book (with David Stark) Post-Socialist Pathways. His current work on the interplay between transnationalization, institutional development and economic change has resulted in articles in such scholarly journals as Review of International Political Economy and Studies in Comparative International Development as well as the edited volume (with Ronald Holzhacker) The Transnationalization of States, Economies and Civil Societies. New Modes of Governance in Europe (Springer, 2009). Gerald A. McDermott is Associate Professor of International Business at the Darla Moore School of Business of the University of South Carolina and is a Senior Research Fellow at IAE Business School in Argentina. He was previously Assistant Professor of Multinational Management at the Wharton School of Business. He specializes in international business and political economy, mainly on issues of institutional change, innovation, risk, and corporate strategy in emerging market countries, particularly East-Central Europe and Latin America. His book, Embedded Politics: Industrial Networks and Institutional Change in Post-Communism (University of Michigan Press, 2002), was a finalist for APSA's 2003 Woodrow Wilson Foundation Award for the Best Book on government, politics, and international affairs. They are the authors of Leveling the Playing Field (OUP, 2014).